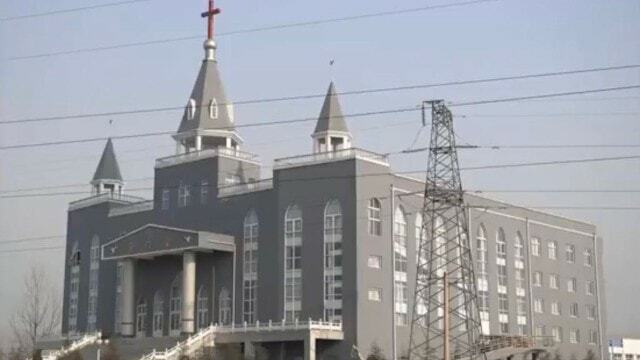 Increasingly persecuted, members of these conservative Protestant churches are fleeing China in growing numbers. Golden Lampstand Church before destruction, from a video by church members. Lawyers and immigration authorities in several countries are increasingly confronted with cases of refugees who report they belong to “Justification by Faith”, or “Sola Fide” Protestant house churches persecuted in China. Indeed, news about arrests of Christians in China now also mention this name often. This did not start recently. 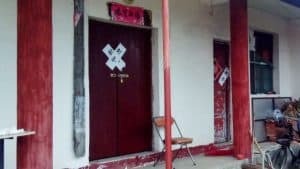 For example, in 2009, five leaders of the Golden Lampstand Church in Linfen city of Shanxi Province, a Sola Fide church, were sentenced to three to seven years in prison for opposing the forced demolition of churches. 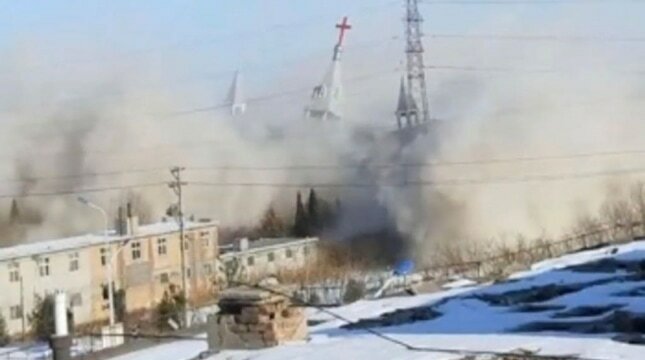 In January 2018, the authorities forcibly demolished Golden Lampstand Church by dynamiting it. 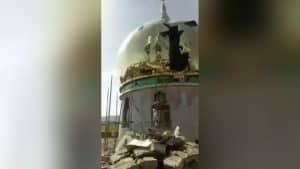 The destruction of Golden Lampstand Church, from a video by church members. 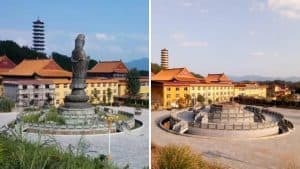 The name of these churches is, however, puzzling, because theoretically, believing in “justification by faith only” (in Latin language, sola fide) is simply synonymous with being a Protestant, as opposed to a Catholic—in China, a “Christian,” as Chinese use distinguishes between “Christians,” i.e. Protestants, and “Catholics,” while in the West the word “Christian” includes both Protestants and Catholics (and Eastern Orthodox). Martin Luther (1483–1546) popularized the formula “justification by faith” as the one decisive to identify who is, or is not, a true Christian. Luther believed that faith in Jesus saves by itself. Salvation is not “earned” by good works. Although Catholic theologians maintained their position was in fact more complicated, Luther and, after him, a large part of the Protestant tradition accused the Catholics (and later the Eastern Orthodox as well) to maintain a doctrine of “justification by works” that was heretic and non-Biblical. Other Protestants accepted the joint declaration, but most conservative Protestants didn’t, and criticized the Lutherans who had signed it for having “sold out” to Rome. Because of the political conditions prevailing in China, Chinese Christians did not participate in the international conversations about justification between Catholics and Protestants. To the extent they were able to have any contact with Christians outside of China, house churches espoused a conservative approach and sympathized with those who opposed the joint declaration and maintained a strict interpretation of Luther’s sola fide as irremediably opposed to Catholicism. There were, however, in China some who were authorized to maintain some international contacts with other Christians, including through the World Council of Churches in Geneva. These were the leaders of the government-controlled Three-Self Church. For decades, the most famous Three-Self leader both in China and internationally was bishop Ting Kuang-hsun (also spelled Ding Guangxun, 丁光訓,1915–2012). 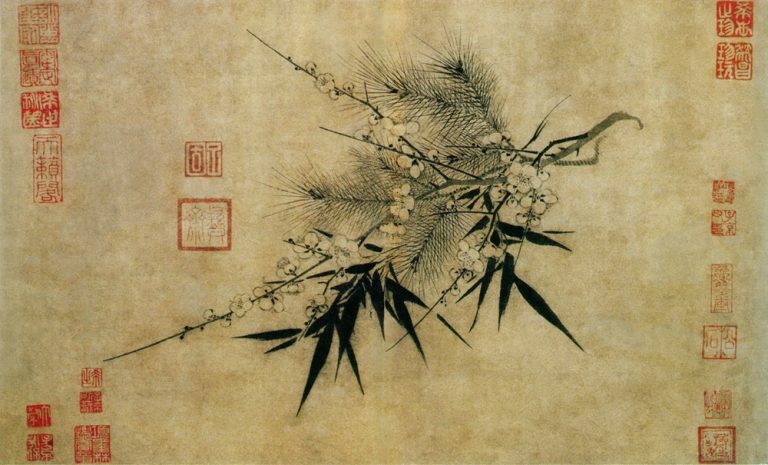 Ting came from the Anglican tradition and had studied in the United States. He was a complex figure. The CCP used him internationally as the public, smiling face of government-controlled religion, but Ting had received a good theological training and had also cautiously opposed some CCP policies. Ting believed that Christianity in Communist China would not survive without sinicization. Rather than resisting sinicization, he proposed to embrace it and to create a theology who would put together Christianity and the CCP’s core socialist values. He elaborated this theology within the framework of the movement known as “theological reconstruction” (神學思想建設), whose aim was to create an indigenous Chinese Christianity after having removed all “Western” evangelical influences. As part of this theological effort, Ting suggested that the traditional doctrine of “justification by faith” created unnecessary divisions and that instead something that was later called “justification by love” should be adopted by the Three-Self Church as a formula capable of unifying the different traditions that had come together in the State-sponsored church. Sola caritate should thus replace sola fide. Later in life, Ting denied that he had in fact advocated these formulas, or rejected the fundamental truth of justification by faith. Scholars, however, see him as the originator of the “justification by love” movement. Some believe this movement was opportunistic, as the Marxist ideology of the CCP would be more easily compatible with a “justification by works” perspective. Christians and Marxists can cooperate in good, patriotic works. More recent studies of Ting, however, evidenced a second root of his theology in the influence of liberal Catholic authors, particularly the French Jesuit Pierre Teilhard de Chardin (1881–1955). Through Teilhard, in the word of contemporary scholar An Chu Tee, Ting “detached the love of Christ from the Cross” in favor of the worship of a Teilhardian “Cosmic Christ” who was also closer to Marxist secular utopias. Wang Mingdao in 1950 (credits). “Justification by love” became a very popular formula in the Three-Self Church, one identifying its theology as truly sinicized and in dialogue with CCP’s core socialist values. Many in the house churches saw the doctrine of “justification by love” as evidence that the Three-Self Church was not only controlled by CCP but also theologically heretic. 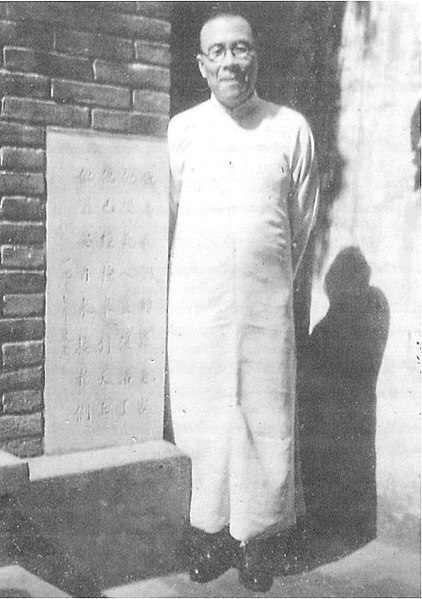 One of their references was Beijing elder (he refused to be called “pastor”) Wang Mingdao (王明道, 1900–1991), who had been arrested in 1955 for his refusal to join the Three-Self Church. He was released in 1980, when his mental and physical condition was declining because of the 25 years he spent in jail. Wang was a staunch proponent of sola fide and an opponent of all kinds of liberal theologies. Another Beijing Protestant leader with a similar theology, who was arrested at the same time of Wang for his refusal to join the Three-Self Church, was Yuan Xiangchen (袁相忱, 1914–2005). The movement of resistance against the Three-Self Church and “theological reconstruction” also developed in Shanghai and Guangzhou, where the respective figures of reference were pastor Li Tianen (李天恩1928–2016) and Lin Xiangao (林獻羔, 1924–2013). All emphasized justification by faith and all spent long years in jail because of their firm refusal to submit to the Three-Self Church. Inspired by these figures, several house churches emerged, either using the name “Justification by Faith” (Sola fide) or being called as such by other Christians. They shared a conservative theology, which rejected “theological reconstruction” but also ecumenism, and Western-influenced liberal theology. They do not constitute a denomination, but a loosely connected network without uniform management. 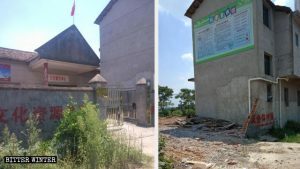 Because of their refusal of joining the Three-Self Church and their rejection of Three-Self theology, which is in fact their very raison-d’être, they have been persecuted by the CCP more severely than other house churches. Criticizing the Three-Self Church is one of the “red lines” house churches should not cross, if they want to keep a chance of being left alone. 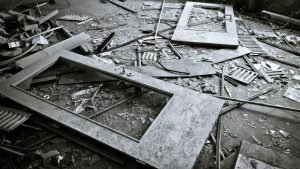 It is important to note that the main reason Sola Fide churches are persecuted is their staunch refusal of joining the Three-Self Church rather than theology. 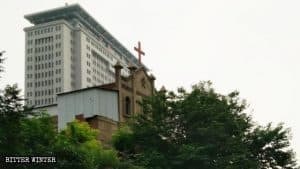 To some extent, theological differences are tolerated in China, provided that churches accept to submit themselves to the Three-Self Church and accept its CCP-appointed leaders. There are no reliable statistics on Sola Fide churches, although some believe they have several million members. They worship on Sunday by singing hymns, praying, reading the Bible, hearing a sermon and concluding with the Lord’s Prayer. Some Sola Fide churches celebrate the Lord’s Supper by drinking grape juice rather than wine. Others drink wine. They celebrate the usual Christian festivities (Easter, Christmas,Thanksgiving) and emphasize the moral values taught in the Gospel. Except for their criticism of the Three-Self Church, which is forbidden in China, members of Sola Fide appear to be law-abiding citizens. However, their theological criticism of “sinicized” doctrines of justification is enough to be severely persecuted in China.